A Week Away From The Computer: Will She Survive? Credits: Paper by Dana Zarling (Designer Digitals, Golden Splendor) and pinned tag by Katie Pertiet (DD, Pinned Sentiments). Font: Euphorigenic. Oh, the challenge part? Well, Julie's quickpage was 4x6, and I don't usually scrap that size, plus, it was totally outside of my color range. But I resized it, overlapped the circles somewhat randomly, and then Dana Zarling's paper just jumped out at me from my trusty Picasa organizer (I later realized that besides the color, the stripes ran the opposite way and that made a cool contrast). I'm really pleased I was able to do Julie's quickpage justice! Wow, I've never made a digital card before. That was fun! And, it was a great way to use one of the birdies I've been working on lately--these guys are sooooooooo cute! I don't know quite how to package them, but I'm sure I'll figure out some nifty way to do that... By the way, this card was *totally* inspired by Geninne's awesome series of birds. 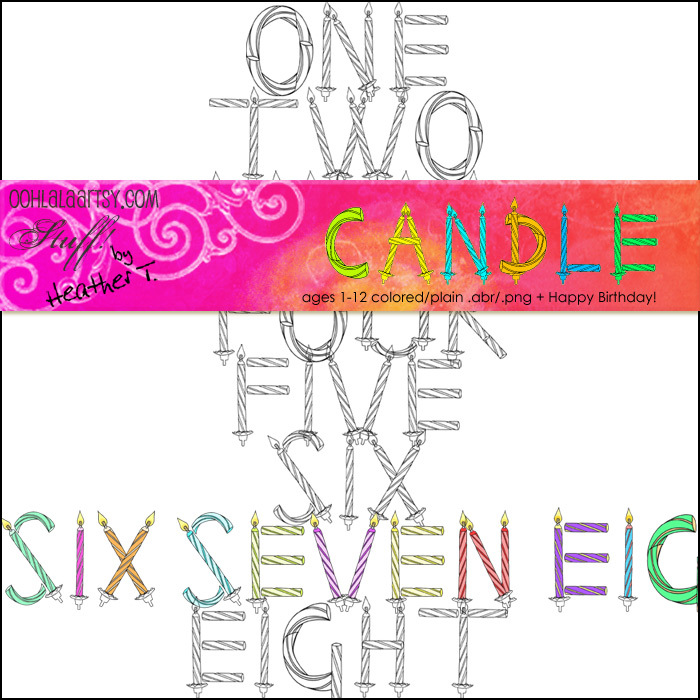 Credits: Bird and branch by Heather Taylor. Postcard from a photo by slafko at Stock Exchange. Papers: Katie Pertiet (Designer Digitals, Web Challenge 7/9/06). Overlay: Cherie Mask (2Peas, Museum Papers). 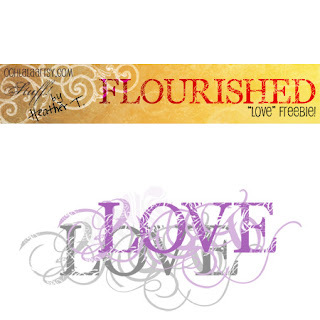 Background stamp: Katie Pertiet (Designer Digitals, LetterBox Clusters 2). Font: 1550. Just a little 5-pack of herbal stickers mixed with some tomatoes and peppers (in case you were hungry!)... Only $1.00! I'm a little nervous about lowering the prices, as Paypal eats 30 cents out of every transaction, on top of the 2.9% they charge, so hopefully reducing my prices won't end up being an even worse choice. I just hope I don't get nickeled and dimed to death! The small tip about this one is something I learned from Cassie Jones at Designer Digitals during one of her chats: on the layer whose shape you want to copy, press ctrl then click on the *thumbnail* of that layer. Shazam! The marching ants go directly around the main figure! This is great when you have all those swirlies that you want to "cut" out of the photo, then scoot over a few nudges to offset them! Once you have your marching ants, then just go to the photo layer, press delete, and voilà, the shape is now cut out! I use this more times than I can remember, I think. The following layout is pretty simple technically--but I did make a conscious effort to use the type as part of the design (here, the repetition of the word "blue" going on and on and up and out of the page, just like the waves in the poem). I love using words (if you couldn't tell ;) and they are often just as much a part of my layouts as any other embellishment. I do this with my cards, too--very often a calligraphy stamp is just the thing I want for "finishing" a card. I'm going to be writing an article on "Digital Alphabet Soup" for SN&R this month, too--all about how many ways you can incorporate type into your layouts! Just a reminder that an easy way to get all those fiddly squares exactly the right size is easy if you set your crop tool to the dimension you want (here, .75"x.75"x300dpi). I also mixed in a couple of photos with all those swatches of patterned paper--the top one of wood, and the final product of the rose. I was just reminded today that it's been a ways since my initial frustrations with the use of patterned paper--now, instead of trying for great big swathes of it, I really try to pare it down and group it around the photo. Seems to work for me! I've never worked with such realistic elements before--it does take some fiddling to resize elements so they don't completely overpower the photo, and so that they're relatively the same size--though I did leave some incongruities, for example, the buttons versus the ribbon. Oh, and the ribbon has the under/over trick going on, so that it appears to be woven under the frame in one part. Just duplicate your ribbon layer, put one under the frame and one over the frame, then erase the little part of ribbon that's over the frame where you want it to look like it's going under (confused yet? *lol*), and there you go! I love doing digital coloring--it's about the only time I ever manage to color inside the lines. For this kind of thing, you use the magic wand set to 1 pixel tolerance, anti-aliased, and contiguous. On the layer where you have the black and transparent .png, highlight the areas you want to color the same color. Then, create a new layer, move it under the .png, and fill with the paint bucket. You can either fill with gradients, or a flat color, onto which you can then brush varying levels of shadow. Just remember to keep your selection till you're done coloring. You can create a different color layer for each section, too, and that lets you use your hue/color adjustment slider later on to fine-tweak the colors. It's a lot of fun! You can color it yourself, or just plop it on the page as is. Plus, there's a brush! 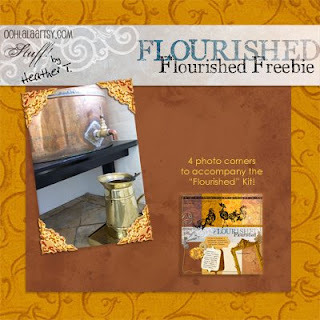 So without further ado, I present to you: Flourished Full Kit, in the Ooh la la, Artsy! Shop! If you don't want the whole thing you can buy the Element Pack, too. 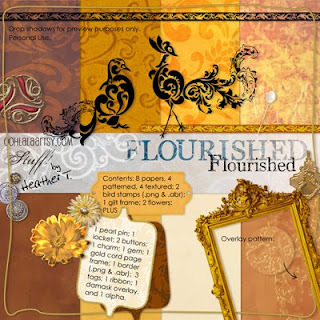 And, there's a freebie to go with it, which you *can't* get in the kit: a set of 4 gold photo corners--something special to set off your beautiful images! Just click on the preview to download. Wow, May 8th... I've really been remiss! Here's a fun one that's totally different from my usual style, with a bunch of elements (mostly by Katie Pertiet and Lynn Grieveson) combining into a sort of fantasy feel. I was influenced by Vinnie Pearce's house layout in the making of the window frame and curtain, too. Here's a layout I made from the new kit--I was worried that there wouldn't be enough "masculine" stuff, but it actually worked out quite well! Here's Allen getting down and dirty while we wait to pick up our doggie from chemotherapy... Fonts: nu-century-gothic and butterbrotpapier. 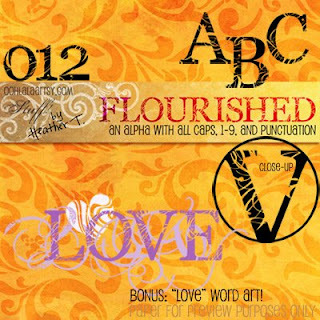 Everything else from my "Floral Play" kit (coming soon at Aussie Scrapbooking). Journaling reads: "You've picked up this strange habit lately of filling your shoes with sand, and tossing them into the air. I get the benefit of the lovely patterns -- your eyes are squinched shut!" To make the arrows, just "draw" with your lasso tool on top of the paper, copy, and paste! To repeat the exact same shape, which I did with the lighter paper beneath, you can create a new channel mask by clicking on the channels tab in your layers palette. With the selection still going (i.e., your ants are marching round and round), click on the icon at the bottom of the channels tab that looks like a little square with a circle in the middle. It will add another layer that looks entirely black, except for your selection which is white. To get the same shape from a different piece of paper like I did, open the 2nd piece of paper, then drag that channel mask over to the paper. Go to the paper's channels tab, and click on your mask. Now you'll see the image turn black and white. Use your magic wand to select the shape you need, then click on the layers tab again so you can see your layers listed, and click on the paper layer. Ta-dah! Your selection is now right there, the same shape as in your other document! Copy the selection, go over to your main layout, and paste! It should create a new layer with the shape you wanted in the new pattern. There are of course all kinds of handy uses for keeping selections in the channels masks, so it's a good trick to know! I *finally* finished the kit for Aussie Scrapbooking! They'll be "opening" next week, I think, and you'll need to register to get the kit. Not sure if registration is free, but the kit is! 1. Pick 5 blogs that you consider deserve this award for their creativity, design, interesting material, and also contribute to the blogging community, no matter what language. 4. 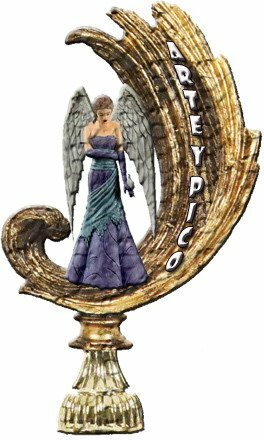 The Award winner and the one who has given the prize have to show the link of "Arte Y Pico" blog, so everyone will know the origin of this award. Two people whom I admire muchly for their art and their personal qualities come from the digiscrapping world: Vinnie Pearce, and Lynn Grieveson. They fit the bill perfectly! So, first up: a layout using one of my overlays, and a painted frame edge. I just discovered the large brushes included with PS CS2. Heh. And this one was using several different photos in Kellie Mize's freebie from last week at Designer Digitals--she had this constellation of frames. I knew I wanted to use at least some squares of patterned paper (I used three, in the end), but placing the various photos of the fire pokers was kind of a serendipitous playfulness. This "technique" was a follow-up from a previous post where I'd also placed several photos into what used to be journaling strips--I find this severe cropping to be really useful when you have a ton of photos surrounding one event. Next week's challenge at 2Peas is with art filters, so I'm looking forward to having fun with that!